Plexidor Pet Doors: Surfing dog! Ricochet is a registered and certified therapy dog who surfs with special needs children and people with disabilities. 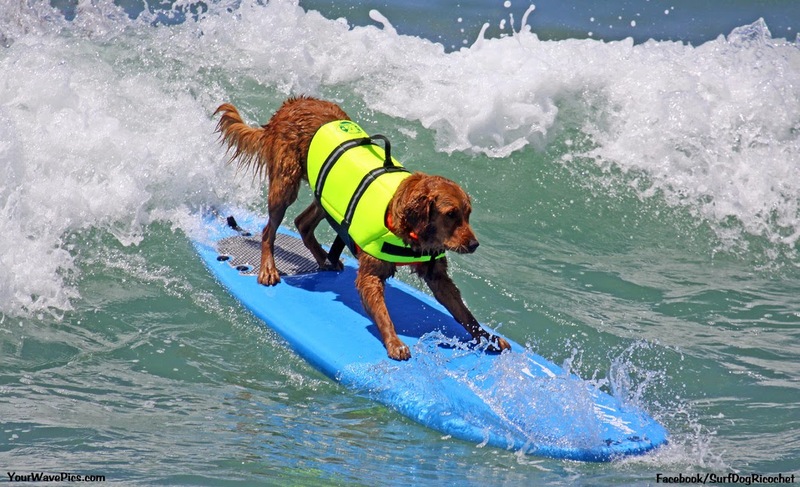 The Golden Retriever also surfs for fun, in contests, with other animals, and raises money for charity. She has surfed since she was 8 weeks old - it started in a kiddie pool - and she is featured in a large number of books and movies. She also participated in the world record of most dogs on a surfboard. If you've never visited Ricochet's website, www.surfdogricochet.com, I warmly recommend it. It's packed with information and contains everything from PTSD service dogs to coloring pages that can be printed out and entertain children. We know about him too. I bet Bailie could be a surfer dog if we lived on the coast! She likes stuff like that.